Of all the coverage of the Penn State meltdown I've watched in this last week of madness — and I've honestly tried to watch as little possible; the story is so profoundly depressing that it damages one's soul just to think about it — the thing that keeps sticking with me is an interview Rick Pizzo of the Big Ten Network did with Joe McIntyre, a student who covers football for the Penn State Daily Collegian. In the wake of all the shockingly ill-considered student protests, McIntyre was the stand-in for The Student Body, a representative to an outside adult world wondering what in the hell is wrong with you kids? McIntyre played the part perfectly, earnest explaining that students were upset that Joe Paterno was fired via telephone call, that the football team was trying to win a Big Ten championship and this was a distraction, that Paterno should be able to go out "on his own terms" and all sorts of other things that absolutely didn't matter a goddamned bit. This is a good kid who just wants to be at Penn State and write about football and party and have fun, and he has probably wanted to do all those things since he first learned what any of them were. All that has been blown up in four days. He wasn't ready to say goodbye to it, and no one else was either. Penn State played its first football game without Joe Paterno on the sidelines in 62 years today, and the final score was so insignificant it's not even worth mentioning here. Today was the ending of six decades of a social structure so insular, so close-knit, that everyone inside it felt protected enough that they never realized no one was. Penn State will have more football games, and a new coach, and new players, but it'll never be like it was again. That's what today's game was about; it was a gathering of public mourning. In a way, it reminded me a little of the regular church gatherings writer Dave Cullen wrote about in his book Columbine that took place in the weeks after the shootings. People just wanted to go someplace that was familiar, that was safe, that made some sense. In suburban Denver, that was church; in Happy Valley, it was Beaver Stadium. A little has been made of a protestor outside the stadium with signs saying, "The kids are what this is all about. Not wins or losses. Put the kids first. Don’t be fooled. They all knew. Tom Bradley and all must go," and of course he is right, and of course the (few) people who accosted him were wrong. All that will be settled, and those at fault will be punished, even if none of them could possibly be as punished as we all want them to be, as they probably should be. [Friends of Weinreb's who moved to Happy Valley from NYC] did so because they couldn't afford to raise children in Manhattan, but they also did it because he couldn't imagine a safer place to raise their kids than a little town in a valley situated three hours from everywhere. I don't know what it feels like to grow up there now. I want these things to disappear from my consciousness, but they won't. The place where I grew up is gone, and it's not coming back. 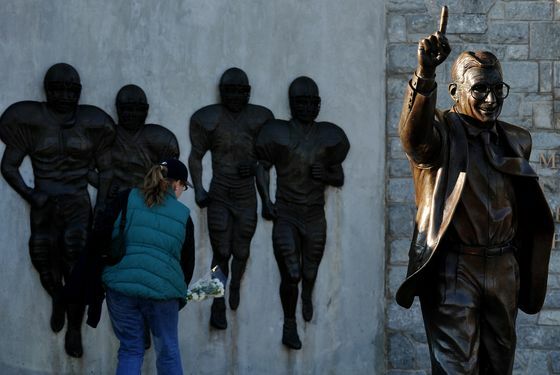 Football didn't mean anything today, the game didn't mean anything today, Joe Paterno didn't even mean anything today. This was about the culture of Penn State, the fans and alums and, yes, staff, who have grown up, now clearly unwisely, with that as the central organizing principle of their lives. This was about them saying goodbye. It's gone, and it's not coming back.